Realmente é um produto excelente, todas as minhas clientes amaram. é bem consistente, realmente cumpre. Na Hair Brasil fiz a aplicação da Cristalização. Eu adorei. Ficou lindo. Liso, encorpado. Deliciosamente macio. Recomendo! Shine Repair is a volatile serum to finalize and repair the whole hair with extreme discipline, softness, and natural aspect. It has thermal-protective and thermal-activated functions that, in contact with heat, releases micro particles to rebuild and provide brightness, which penetrate in the hair promoting an inside-to-outside treatment. Its formula contains Silk Proteins, Noble and Volatile Silicon, Prodew 500®, and UV Protector. Shine Repair is not removable by water and also protects your hair from sea’s salty water and pool’s chlorine. Result: Shine Repair protects your hair from heat and UV rays, and also leaves it disciplined, soft, and naturally bright. Silk fiber famous brightness is partially due to a simple amino acid composition that allow greater light reflection. Added to hair products as Shine Repair, it delivers more moistening fixation, along with a velvety sensation, more brightness and manageability. A combination of types of silicon with ideal softness and volatility, which adhere to the hair delivering protection, brightness and softness. A leading edge technology with 11 powerful amino acids combined. 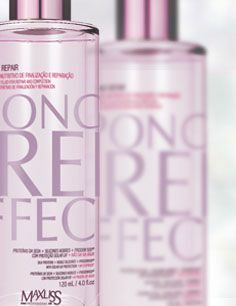 Its composition restores hair surface, retrieving bright immediately. It aligns cuticles and promotes intense hair volume reduction. It can be applied in wet hair to ease brushing and protect from hair dryer and hair straightener heat, or after finalization to repair the tips and protect from UV rays, pool’s chlorine, or sea water.